As you might have noticed on our website home page, and on our Facebook news feed, Blue View Divers became a Shark Guardian Centre last year. Who are the Shark Guardians, you might ask? If you don’t know already, they are the highly motivated and passionate husband and wife team, South African Brendon Sing and Elizabeth Ward-Sing from England! So, what sets Shark Guardian apart from other conservation organisations? 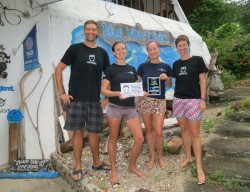 – Their team are highly motivated, passionate people who are actively involved in shark diving and shark research. – They is led by professional scuba diving instructors and educators who collectively have thousands of hours of shark diving experience. – They regularly give professional educational presentations about sharks to school students, adults, divers and the general public worldwide. – They educational presentations are state of the art, up to date and specifically adapted for appropriate audiences. – They have an audience of over 20,000 people a year attending our educational presentations in several countries around the world. – They initiated the Thailand eShark Project – the largest citizen science project in Thailand to monitor shark populations. – They produce and develop educational materials in international languages to enhance conservation education. – Shark Guardian actively networks and promotes projects from other organizations for the benefit of shark and marine conservation, maximizing time and resources. Check out their Facebook updates for recent events and news. Some great news recently coming through from Shark Guardian is that Thai Airways announced a ban on transporting Shark Fins, which is fantastic!